Organizers and Chair: Naran Bilik et Al. If there is to be an anthropology of â€œChinese Shamanismâ€, it is evident that it will require new sets of analytical tools, trans-boundary conceptual frameworks, and hermeneutical approaches that will unravel new open understandings of Chinese Shamanism; as China, form and reform itself, both in physical and ontological senses. The current endeavors in the study of Shamanism, especially in Chinese contexts, are defined by such key items of social-scientific lexicon as â€œcultureâ€, â€œreligionâ€, â€œinitiationâ€, â€œritualâ€, â€œrepresentationâ€, â€œsemioticsâ€; rarely, if not never, Shamanism has been addressed as â€œflowsâ€, â€œhybridityâ€, â€œnetworkâ€, â€œcontinuity and mutationâ€, and so on. Such a situation calls for a heightened level of reflexive scrutiny of our categories of analysis, if we are to gain critical and frontiers-broadening perspectives on the transforming states of Shamanism. How should we interpret the distinction between shamanism as religion and shamanism as culture by locating the former in the dangerous locus while the latter in the benign in the state configuration of ideologies and their governance by the government? Through transported mental scapes and substantiated socio-cultural contexts, is it possible for us to map out the fundamental mental and spiritual structures beyond political harangues, power contestations and conspiracy, both in civil society and state/nation-building levels? Beyond mystic narratives and â€œtrance-formingâ€ expressivities, can we envision a grass-roots shamanistic politics without verticality? 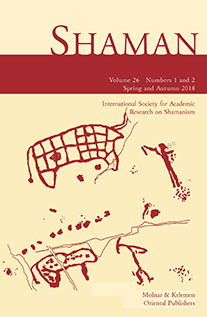 To be sure, the conventional academic theory in the study of shamanism is by now ready to see that the â€œshamanistic dialoguesâ€ does not work the way current models of Shamanistic politics suggested, either in northwestern China or East Sea/South China Sea â€“ all could be defined as trans-topos shamanistic encompassment. When we consider Xi Wangmu, Mazu, Qixi (Night of Sevens), Bixia YÃ¼anjÃ¼n, (Sovereign of the Dawn Clouds), Old Granny Autumn Tiger, Old Tiger Auntie (or Mother), Autumn Barbarian Auntie, She Wu(â€œSnake Shamanâ€), etc., how shall we explore the power topographies of shamanistic figures, genealogy of shamans and â€œamphibian dominanceâ€ of shamanistic figures? Shamanism as a word is originated in Manchu-Tungusic regions bordering Northeast China and Siberian Russia. Making use of the metaphoric legend of Chinese antiquity on the blockage of passage between heaven and earth, the author tries to interpret the distinction between shamanism as religion and shamanism as culture by locating the former in the dangerous locus while the latter in the benign in the state configuration of ideologies and their governance by the government. Shamanism is more deeply involved in bodily practice and spiritual activity, and therefore poses a danger as a religion when it connects â€œheavenâ€ and â€œearthâ€. However, shamanism is benign when it looks merely as culture when it sits comfortably between â€œheavenâ€ and â€œearthâ€ without the motivation of connecting them, leaving room for the government to make such connection happen according to their practical desire and design. When shamanism equals culture it functions only as â€œsocial intimacyâ€ (Michael Herzfeld 2005), a kind of embarrassing necessity. When shamanism is synonymous with religion, however, its nature will change from neutrality to antipathy according to the political barometer of the government due to its uncontrolled and uncontrollable prevalence in everyday life. The dualistic treatment of shamanism as much as Islam and other religions by the Chinese government can make it dangerous as religion or make it neutral as culture. Such double treatment of shamanism betrays both complexity and vulnerability of political life in China. In conclusion, the author holds the view that the dual role of shamanism in China helps Chinese authorities make good connections ideologically with the locals at the grassroots level. It also helps build and maintain deliberative democracy by constantly connecting â€œheavenâ€ and â€œearthâ€. Based on the missing of Malaysia airline in March, despites justifiable data and facts produced by media, conjectures, misunderstandings and conspiracies abound. In order to pontificate the dilemma and cognitive limitations of media, this paper intends to analyze shamanistic contestations, power configuration and spirited dialogues in the territorial disputes of South China Sea issues among claimant countries, through examining a few typical cases such as Malaysian missing airline (use of Shaman to locate the whereabouts of plane), Chinese Mazu and Philippine Voodoo priests, in order to mapping out the fundamental mental and spiritual structures beyond political harangues, contestations and conspiracy. In this occasion, the discussions of Malaysian airline can be understood more as a hermeneutical subject rather than as routine accident news through anthropological reflections and phenomenological corroborations, which will shed lights on the ever aggregating political and socio-cultural contestations in this region. Based on my recent fieldwork in a Kam village in the Liping county of Southeast Guizhou in China, this paper examines the Kam shamansâ€™ contested roles in the community-based fire disaster prevention and management. The Kam, linguistically belonging to the Austronesia-Thai language family, are a Tai-speaking people mainly inhabited in the adjacent border region of Hunan-Guizhou-Guangxi provinces in Southcentral China. Living in wood-built houses compacted in their rural settlements, the Kam people regard fire disaster as the most dangerous and destructive to their life. Different from the Wittfogelian classic hydraulic model, fire disaster prevention and management plays more a critical role in the Kam social-cultural topography in general, and in its local politics and ritual system in particular. In the annually held event Toip Xangp Xaih (which literally means â€œVillage Purifying Festival â€), Kam shamans routinely perform a series of rites that negotiate the ecology between people and their built environment, and regulate the folkways in which fire is used, controlled, and managed, thus functioning as a de facto leader of the community based fire disaster prevention and management project and a lead educator of local knowledge about fire. Related to the Toip Xangp Xaih is the post hoc ceremony of Xuds Xaih (literally â€œvillage washingâ€), which is normally performed by the same shaman or same group of shamans after occurrence of a fire disaster, as part of the disaster relief actions. However, as manifested in the nuances in the process and procedures of the event, the Kam shamanâ€™s role is highly contested: While shamanistic practice in general is still viewed as superstitious, pre-modern, and backward in the official system of cultural politics, certain shamanic performances have been selectively redefined as traditional cultural heritage so that they can be legally appropriated to forge a community-based integrated mechanism of fire disaster prevention and management. In their most recent attempt of application for officially enlisting the Toip Xangp Xaih (â€œVillage Purifying Festivalâ€) as an intangible cultural heritage masterpiece at prefectural and provincial level, the shamans, government officials, and native scholars have been working closely hand-in-hand, whereas the ideological demarcating boundaries is still salient. Obviously, as we can see from these contested scenarios, the topography of shamanism in China is changing in its own way with its own pace; and teleology and ideology may not necessarily be foes but rather friends. Research carried out by several anthropologists indicates that the economic, religious and ceremonial activities of the Shavante indigenous group of Mato Grosso state, in Brazil, are linked together in a mutually constitutive way. The Shavante dedicate themselves to agriculture, but hunting has historically been a very important part ofÂ subsistence and social life. Some of theÂ Shavantesâ€™ types of hunting and meat distribution ceremonies are deeply associated with shamanic ritual. Economic development in Mato Grosso has led to rapid transformations in indigenous lifestyles. Deforestation, missionary groups and government social services have contributed to a shift away from hunting and gathering. In contrast, the Sea Gypsies and diaspora in Xiamen and Chinaâ€™s Southeast Coastal region are facing the same challenges and changes due to political contestations and lifestyle change. This paper will examine the hypothesis that shamanic beliefs still heavily influence localÂ attitudes towards the local economy, including neighboring global and domestic investments, and towards economic development and prosperity more generally. It will also analyze the influence of local economic development and its social and environmental impacts on the Shavante belief system. The analysis is not representative of the whole ethnic group, but reflects the views of Rafael Weree, an author of this paper from the Shavante tribe, and his immediate family and friends.